Abstract: It is widely acknowledged that the sustainability challenges facing the world require new approaches to teaching and learning. At the community level, however, sustainability priorities are context specific, so prescriptions of what and how to teach for sustainability are limiting. In higher education, one innovative approach to sustainability education that acknowledges the limits of conventional coursework involves courses based on “shared action learning” – a process in which students, faculty, and community sponsors share learning experiences while working on sustainability projects for a specific community. Shared Action Learning can be applied in any community context near or far from campus ranging from the very local campus community to distant settlements across the globe. This paper describes the processes, opportunities and challenges of shared action learning through five stages: (1) project impetus, (2) contextual research and project planning, (3) community engagement and project refinement, (4) action, and (5) reflection and reporting. 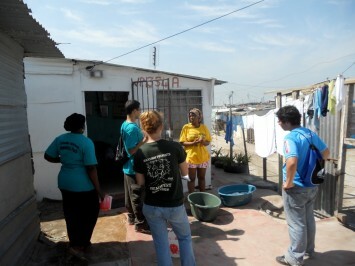 The roles of students, faculty, sponsors, and communities throughout the semester-long shared action learning project are explored through two examples – a course at Clark University in Worcester, MA that focuses on SAL within the college campus community and a Worcester Polytechnic Institute program through which students work on projects with partners in informal settlements in Cape Town, South Africa. Keywords: experiential learning,community sustainability,project-based education,campus sustainability,Africa. Sustainability challenges facing the world demand new approaches to teaching and learning (Orr, 1994; Rowe, 2007; Selby, 2007). Higher education is responding to these challenges in multiple ways (Rappaport & Creighton, 2007) including: prioritizing sustainability practices in campus operations (Rappaport, 2008; Sharp, 2009; Breen, 2010), supporting more socially engaged sustainability-related research (Kates, Clark et al., 2001; Stauffacher, Walter et al., 2006; Crow, 2008; Kajikawa, 2008), engaging more intentionally and frequently on sustainability issues with non-academic partners (Maurasse, 2001; Boyle, Ross et al., 2011; Molnar, Ritz et al., 2011), and adapting curriculum and pedagogical approaches to integrate sustainability in teaching and coursework (Tamura & Uegaki, 2012; Weissman, 2012). Among the various approaches to integrating sustainability into university curricula, developing coursework that facilitates applied and practical experiences provides some of the most innovative and important opportunities for learning about the complexities of sustainability (O’Brien & Sarkis, 2012). Movement toward more engaged and practical “experiential” teaching and learning reflects a broader movement to more powerfully link conceptual and practical knowledge to action for sustainability (Kates, Clark et al., 2001; Stephens & Graham, 2008). A central part of this movement is participatory research that integrates stakeholder knowledge into the research process (Blackstock, Kelly et al., 2007), based on collaboration between social actors and researchers (Nevens, Frantzeskaki et al., 2013). Participatory action research (PAR) is one important framework for bringing researchers and community stakeholders together as members of a knowledge production collective that focuses on effecting social change (Greenwood, Whyte et al., 1993; Kindon, Pain et al., 2008; Smith, Bratini et al., 2010). The explicit link between knowledge and action is also fundamental to the emerging academic field of sustainability science, a field defined by the problems it addresses rather than the disciplines it employs (Kates, Clark et al., 2001; Clark, 2007; Kajikawa, 2008). In addition, interest in “actionable science”, designed with an explicit focus on stakeholders’ needs and interests, has also been growing (Palmer, Bernhardt et al., 2005). Throughout higher education, different kinds of innovative new transdisciplinary programs that cross boundaries among disciplines and between academic and non-academic actors are emerging and developing (Kates, 2002; Wainwright, 2010). Beyond sustainability, other societal changes are also pressuring higher education to integrate more practical and applied experiences into their coursework (Budwig, Baird et al., 2011). These synergistic pressures include efforts to expand liberal arts education to include skills for effective practice, particularly in the current era of competitive job markets and rising costs of higher education (Labaree, 2006; Arum & Roksa, 2011; Martin, 2011), concern about civic engagement for democracy (McIlrath & Mac Labhrainn, 2007; Thomas, 2010), and recognition of the pedagogical value of “learning by doing” (Sadler, Burgin et al., 2010) and “service learning” (Mohan, 1995; Eyler, Giles et al., 2001; Butin, 2006; Stoecker & Tryon, 2009). All these approaches offer opportunities to advance the broad field of sustainability, in particular work at the local level, where macro challenges of global sustainability typically become extremely context specific. For example, uncertainty about how broad patterns of future environmental change will manifest typically increases as the scale of analysis narrows geographically, while a community’s capacity to cope with, adapt to, or benefit from environmental change depends significantly on the ability of local institutions to command resources and foster coordinated action. In a broader sense, the very meaning of sustainability is highly contested and contextual, reflecting social, environmental and economic dynamics (Campbell, 1996). Lessons from sustainability science have established the importance of generating shared understandings that are legitimate, salient, and appropriate (Cash, Clark et al., 2003). Teaching and learning for sustainability thus requires helping students and others to become better able to integrate and act on different kinds of knowledge aimed enhancing community resilience and wellbeing. Ultimately, effective higher education for sustainability involves participating in the full arc of sustainability challenges. This paper describes an innovative approach to facilitating sustainability education in higher education based on Shared Action Learning (SAL), a process in which students, faculty, and community sponsors share learning experiences while working on sustainability projects for a specific community. The SAL approach was developed at Worcester Polytechnic Institute (WPI) to support student projects undertaken through WPI’s Cape Town Project Centre, which engages students on collaborative projects in disadvantaged communities in Cape Town, South Africa (Jiusto & Hersh, 2009). SAL can support experiential learning in any community context, however, and we therefore also discuss its application in a campus-based, project-based course called The Sustainability University at Clark University in Worcester, MA. The goal of this paper is to explore how SAL can help students, faculty, and community partners engage in mutually beneficial sustainable community development projects. First, we provide an overview of SAL and each of the two case study programs noted above. Then, we explore opportunities and challenges of SAL through five aspects of project development that are presented here for expository purposes as sequential “phases”, even though they are in actual practice highly recursive and overlapping: (1) project impetus, (2) contextual research and project planning, (3) community engagement and project refinement, (4) action, and (5) reflection and reporting. We reflect throughout on the non-traditional roles that students, faculty, sponsors and communities assume in each program, and conclude with a discussion of overarching themes about experiential learning and the pursuit of sustainability. Shared Action Learning (SAL) is an approach developed to provide students and faculty engaged in sustainable community development projects with a common set of ideas and vocabulary from which to work (Figure 1). SAL adapts ideas from participatory action research (Greenwood, Whyte et al., 1993; Kindon, Pain et al., 2008; Smith, Bratini et al., 2010) and Asset-Based Community Development approaches (Mathie & Cunningham, 2003) aimed at facilitating cooperation between academics, communities, and stakeholders engaged in sustainable community development activities. Projects provide learning opportunities that occasionally result in peer reviewed and other professional literatures, but they more often produce focused plans, actionable insight, and/or tangible results for partners and communities. develop greater capacities for creativity, perseverance, compassion and humility. Figure 1. Graphic representation of Shared Action Learning (SAL), co-created with students and faculty. The graphic demonstrates how reflection, sharing, and learning are core with actions of connecting, observing, planning, acting, and reporting. And each SAL experience is defined by the social, cultural, and ecological context within which the project is situated. SAL projects are thus motivated by a simultaneous desire to advance sustainability through directed social change while fostering learning and growth of all participants. We begin by helping students see how they and their project work are situated within broad social, cultural, and ecological contexts that will permeate every aspect of project development. Like other kinds of action research, these projects have a different orientation to knowledge creation and “good practice” then traditional science, wherein research methodologies are designed to “discover” objective knowledge by, among other things, controlling for, rather than working with, social and cultural process. The SAL approach encourages openness about project problems, and expects students to be rigorous, honest and insightful about their engagements with others and the multiplicity of perspectives they encounter. Projects typically involve the following elements: Connecting (e.g., with sponsors, faculty, and other interested parties); Planning (e.g., how to interview others, how to analyze existing conditions, how to design and build a particular facility, how to prepare a proposal or plan a program, etc. ); Acting (conducting interviews, taking measurements, engaging with community members, implementing a program or building something, etc. ); and Reporting (e.g., preparing meeting minutes, summarizing interviews, writing a formal end-of-project report, given a public presentation, etc.). In some projects these elements may play out in reasonably discrete stages and be reported using a fairly traditional narrative structure (background, methodology, results and analysis, recommendations), while in others the process is much messier, improvisational and emergent, with many feedback loops. Permeating the project experience are processes of sharing, learning, and reflection. It is through sharing that opportunities for collective planning and action arise, and through individual and group reflection that meaning is derived from, and used to interpret, experience. Reflection and sharing occur through many familiar modes that often overlap strongly with reporting – directed individual assignments, group discussions, preparing project executive summaries, etc. – as well in more novel ways discussed below. Vercoe and Brinkmann (2012) recently argued that the very different meanings that sustainability can have in different contexts requires that instructors take markedly different approaches to teaching sustainability depending on locale. We agree students need to develop a deep appreciation of social and ecological context, but we also want to highlight here the wide applicability of the shared action learning approach and the commonalities of engaging in experiential learning essentially anywhere. To explore this issue, we consider SAL in the two very different undergraduate programs for which we are faculty instructors. Programmatically, the Cape Town program requires strong institutional, financial and logistical support and hence is not easily replicable, while The Sustainable University course is inexpensive and comparatively easy to offer anywhere. Between the two programs lie innumerable opportunities, in communities near and far from campus, where our institutions and many others look to engage students in sustainability-related projects. In the next sections we briefly describe the case study programs, then discuss some of the sharing and learning opportunities that exist throughout all stages of project development. A unique, community-engaged undergraduate course offered at Clark University since 2005, The Sustainable University was designed to integrate both theory and practice of sustainability by examining the role of higher education in promoting change toward sustainability. Building on Clark’s long-standing tradition of integrating campus- or community-based projects in coursework, the course integrates sustainability and sustainable development with organizational and behavioral change, using semester-long team projects focused on contributing to existing campus sustainability organizations or initiatives. The course focus on the campus community allows students to experience the practical challenges and opportunities of defining, designing and implementing sustainability initiatives. To achieve these goals, the course is structured around weekly reading and writing assignments coupled with semester-long team projects in which students are actively contributing to social, technical or organizational change on campus or in the local community. The team projects provide practical experience in which students learn first-hand the challenges and opportunities of attempting to facilitate change toward a more sustainable community within their own familiar campus community. Examples of recent projects include: working with the Clark University Environmental Sustainability Taskforce to assess implementation options for addressing transportation within Clark’s Climate Action Plan; designing, fundraising and coordinating with the campus grounds crew the installation of a Rain Garden on campus; promoting awareness among faculty, staff, and students about the university’s off-campus arboretum; working with the student campus garden club and the sustainability food group to support the continued development of growing food in the garden behind the President’s house; and in conjunction with the university sustainability office, maintaining and expanding the utility and awareness of a campus-wide inventory of all sustainability projects. Other projects in the past few years have included reviewing renewable energy options for the campus, promoting behavior change in the residence halls through a sustainability competition, helping to coordinate the Massachusetts Climate Action Network Annual conference which was held on campus in the fall 2010, and exploring the potential of setting up a sustainability fund on campus to support new initiatives. The focus of this course on higher education also provides a lens for students to examine how organizations with complex structures make a myriad of decisions with environmental consequences. While universities are unique societal organizations in some respects with their educational mission and prioritization of academic and intellectual pursuits, they are also faced with many challenges and limitations similar to those faced by other organizations, including balancing their budgets, sustaining their reputation, and attracting and retaining skilled professionals. Students gain skills in communication, decision-making processes, communication, sequencing, and collaborative implementation of ideas. This course is an example of a “grounded curriculum” in which the physical campus and surrounding community is critical to learning (Lang, 2012). Students learn to question, analyze, and reconsider their own community practices, as they are encouraged to constantly ask themselves whether, how, and in what ways their experiences in higher education are contributing to or detracting from the sustainability challenges of the 21st century. The WPI Cape Town Project Centre (CTPC) was established in 2007 with a mission to engage students and faculty in research, education and action in support of sustainable community development in informal settlements and other disadvantaged communities in and around Cape Town, South Africa. Each year, anywhere from 24 to 29 WPI undergraduate students and two faculty advisors spend two months in South Africa working full-time on about six projects in teams of 3-5 students. The CTPC is one of 25 or so WPI Global Perspective Program project centers around the world; these project centers have been designed to give students an intensive, interdisciplinary, open-ended, cross-cultural experience that will help them grow professionally and personally (Jiusto & Hersh, 2009). Students receive course credit for a 7-week on-campus preparation course (1.5 course units) and for the subsequent 7-week travel term (3 course units). At the CTPC, student teams work with municipal agencies, NGOs, communities and local businesses on a wide range of projects, most focused on social and urban planning processes to support multi-stakeholder partnerships and community-driven development in informal settlements. Informal settlements (“squatter camps” or “shantytowns”) are home to perhaps a quarter of Cape Town’s 3-4 million population, mainly rural migrants and others drawn to the city’s economic and social opportunities. Most live in small shack homes with rudimentary access to water, sanitation, electricity and other basic amenities. These are places of great hardship and deprivation, but also places of liveliness and love, ingenuity and creativity, hope and aspiration. Community leaders, government agencies, and NGOs active in informal settlements are chronically under-resourced and hard-pressed to advance sustainable community development. Many have welcomed WPI students to work on a wide range of projects having to do with town planning, support for local entrepreneurship and community-based organizations, and urban agriculture and early childhood development, as well as various small building projects. The CTPC also maintains an ongoing program to address water, sanitation, hygiene, and storm water management needs in informal settlements. All projects involve consideration of social process and “current conditions” analysis and result in formal reports, project websites and recommendations. Most projects involve local community members working closely with students to maximize the opportunities for cross-cultural sharing and learning, and to assure the project is well-informed by local ideas, creativity, needs and potential ongoing viability. Projects often include “prototyping” (i.e., implementation) of at least some part of a larger program or project. Prototyping is a research methodology designed to assure larger plans or initiatives are well grounded in local realities. It is also a strategy for rich engagement and exchange with local people, and a discipline for assuring that projects strive for at least some outcomes that are tangible and meaningful to local people and achieved in concert with them. The CTPC thus aims to be an experiential learning program not just for students, but for communities, sponsors and faculty. It is also a social entrepreneurial enterprise that works collaboratively with others to create innovative responses to the challenges of sustainability in rapidly transforming urban and peri-urban communities in Cape Town and around the world (Elmes, Jiusto et al., 2012). SAL projects can be thought of as moving through five idealized “stages”: (1) project impetus, (2) contextual research and project planning, (3) community engagement and project refinement, (4) action, and (5) reflection and reporting (Table 1). Different SAL actors are typically more actively involved in different stages. Table 1 Five stages of Shared Action Learning (SAL). The dark shading represents those SAL actors most involved in each stage. The initial phase of project development requires the faculty and project sponsors to learn about one another’s programs and to share risks inherent in collaboration. For example, faculty at this phase typically know little about the specific students who might work on a particular project, so their likely strengths and weaknesses and ability to meet sponsor expectations can only be inferred from past experience. Sponsors in turn, especially those new to the program, are committing organizational resources (mainly time) to working with students. The more critical the project is to the sponsor, the more they have at stake in its outcome, and the greater the risk should the project not meet expectations. To begin establishing a working relationship, faculty within the CTPC provide potential sponsors a brief written description of program particulars addressing what they can expect from WPI and what is asked of them. Within Clark’s Sustainable University course, projects are usually identified in collaboration with the campus sustainability coordinator, who facilitates coordination with participating campus offices and ensures that projects are consistent with ongoing campus sustainability initiatives. In both cases, the project impetus stage involves frank discussion between the faculty and the sponsors about possibilities and ways of working together. Each project is a unique, dynamic, evolving entity and relationships with project sponsors are critical. Even when faculty members work with the same sponsor multiple times with a different cohort of students, a simple expectation of repetition is not possible or desirable because each experience builds on previous ones. Circumstances and people are always evolving. The faculty-sponsor relationship involves trust, as the teacher turns over a significant level of pedagogical control to sponsors, and sponsors rely on students to meet important goals. Good working relationships are important, not least because students often struggle with the open-ended nature of projects and can grow frustrated, leading to questions, such as, How do we reconcile different ideas about the project goals? Our sponsor isn’t giving us what we need, what do we do? Our sponsor is happy with our work, why aren’t you? Such challenges only grow as other actors also take a stake in the project. It is helpful if faculty and sponsors share an understanding at the outset that managing such tensions represents an important learning opportunity for students, and agree they will each help students explore why tensions exist and how they might be resolved in ways that respect diverse needs and perspectives. In the Clark Sustainable University course, projects are pre-defined by the faculty instructor in conjunction with the Campus Sustainability Coordinator and potentially other relevant on-campus sponsors before the semester begins. This coordination with campus sustainability initiatives has evolved over time. In earlier years, students’ self-identified projects at the beginning of a term and set about developing relationships with campus partners as appropriate. While some projects resulted in successful implementations, it became clear that projects have greater potential if coordinated more closely with ongoing sustainability efforts on campus. A strong sustainability coordinator with leverage with the campus physical plant and the president’s sustainability task force ensures that projects are consistent with and sensitive to the many institutional efforts to move the university toward sustainability. In the Clark University course, at the very beginning of the semester, after the students are introduced to a varied set of potential team projects, each student submits an application (including a resume and cover letter) to the instructor indicating their preferred project. The instructor then interviews and evaluates each applicant and creates the teams. In Cape Town, projects have also evolved over time as faculty members have become more experienced working in informal settlements. Community members and those in government and civil society typically have very different ideas about project development with respect to planning processes, timeframes, measures of success, managing resources and political processes, distributing benefits, and sharing responsibilities and risks. The CTPC has found a niche in having students operate across these divides, bringing a sense of empathy to all involved and bringing enthusiasm and concerted (if inexperienced) effort to chronically under-resourced partners. A key initial role for sponsors is to help assess health and safety risks to students and to identify those community leaders and residents who will work closely with students to assure they are safe and their efforts grounded in local realities. Once the basic parameters of projects have been agreed upon by faculty and sponsors, responsibility shifts to students, whose initial job is to strategize about how to understand the project challenge and to conduct the research necessary to respond effectively. During this phase, students work closely with faculty to understand the sponsor and the sponsor’s expectations. Sponsors often suggest reports and other resources as starting points for student research, and in on-campus projects students may meet with sponsors for informational interviews, but faculty are responsible for guiding and assessing student research activities during this initial phase of SAL projects. Teaching involves a mix of introducing students to overarching concepts and contextual issues, while also helping them develop sound strategies for conducting background research and planning appropriate methodologies for their original project work. Conceptually, both programs reviewed here emphasize the pursuit of sustainability as complexly interwoven social, technological and ecological processes involving different social actors with competing interests, ideas and perspectives. Class time includes discussion of social, cultural and ecological considerations of sustainability “on campus” or in communities, including issues of social justice. Students are asked to reflect on the role they see themselves playing through their projects. Are they researchers? Consultants? Activists? Learners? Educators? Analysts? A significant SAL objective is to emphasize the many roles students and others play, building both a sense of purpose and a sense of modesty about one’s own positionality, i.e. how each individual fits and relates to others within the larger social context. Sharing and learning are to be touchstones throughout the process. This sharing and learning extends also to faculty. While the programs are thematically based in campus sustainability and urban community sustainability respectively, student teams work on many different specific topics, some well outside the faculty’s areas of expertise (but presumably then more within that of the sponsor). Faculty serve less as instructors and more as advisors to help students understand conceptually and practically how to advance a project and how to learn on their own to develop topical expertise. At WPI, the term before travel provides a distinct preparation phase in which the students’ work is organized through preparing a formal project proposal that summarizes their background research and proposed plans for field activities. In the Sustainable University course at Clark, similar activities are undertaken, though the preparation and field activities occur throughout a semester length course without a separate period of project immersion. In both cases, the educational goals are for students to learn how to conduct open-ended research (e.g., “learning from others who have addressed similar challenges”) and to develop logical, clearly articulated plans. They also explore methodologies, but as opposed to more formal social science methods courses that assume a distanced researcher, the emphasis in these SAL courses is on strategies appropriate to engaging with others to learn from them – about their perspectives, their creative ideas, their sense of opportunity and obstacles – and in some cases to cooperate on advancing a shared agenda. These are skills that develop over a lifetime, and students show a great range of starting capabilities and growth in this area through the projects. Interviewing and meetings (whether with students, faculty, sponsors, community members, or others) are two very practical engagement techniques that have great future utility in all sorts of professional and vocational undertakings. The contextual research and planning phase also allows teams to begin working together intensively and developing the kind of team cohesion needed to work well in a new and challenging learning environment. The student team is a critical realm for ongoing shared action learning, providing students opportunities to practice skills of cooperation, coordination, collaboration, contribution, communication, and complementarity (the 6 Cs of teamwork). In both programs, students receive training in effective group functioning and have regular check-ins on group dynamics. Support is available for those that face difficulties. SAL programs engage with communities in order to immerse students in complex learning environments. By leveraging the heightened sense of motivation and responsibility many students feel when presented an opportunity to work on a real challenge for people outside the classroom, it is hoped that students will learn more and that students and their academic institutions will learn over time how to make new kinds of contributions to society, perhaps in the process gradually transforming how academic institutions understand their mission and pedagogical strategies (Levin & Greenwood, 2008). “Community” can mean just about any kind of social group, and in these programs, the critical issue is that students feel a sense of connection to that group such that they see their work as meaningful to others. As noted earlier, the two programs highlight ends of a spectrum in terms community. Clark students work with the campus community, which most feel strongly connected to and may even identify as their primary community, though they may still have a very limited sense of how it functions institutionally and with respect to sustainability issues. Students working in Cape Town’s informal settlement communities will usually only have read about them, and will have little initial understanding of daily life or community decision-making processes. They will likely be seen, and see themselves, as “outsiders,” raising challenging questions of poverty and privilege, race and identity, responsibility and power, etc. An important learning opportunity students encounter wherever they work is the multiplicity of perspectives and interests within communities, whether that means differences between a university’s Facilities Department and the “environmental activist community” on campus, or differences of opinion among neighbors and organizations within informal settlements about planning practices, access to resources, and visions of change. Precisely because of differences within and between communities, a key element of the community engagement aspect of project work is for students to interact with many different people to map out “current conditions” and people’s views about them, and to gather ideas as to what problems exist and how they may be addressed. These SAL programs have shown that, almost regardless of culture or context, people often are predisposed to helping students understand issues, and students are viewed as valuable resources unburdened by responsibilities and institutional baggage that sponsors and community members may carry. In Cape Town, the project redefinition dynamics noted above are experienced regularly, and project topics that were agreed upon just months or even weeks prior to the students’ arrival are sometimes completely abandoned. In one community-based construction project, the sponsor requested over just a few weeks a change in the project focus from building a one-room early childhood development learning center, to a playground, to a hand-drawn bookmobile, to a two-story community center, to a major renovation of an existing shack/community hall, to design and installation of a small, innovative sanitation system. The root of such major project upheaval lies in the fundamental challenge faced by local partners – life in poor communities is hard and people are vulnerable to all manner of major or minor catastrophes. Residents develop sophisticated, flexible strategies for managing the vulnerabilities of daily living, and a premium is placed on skill in short-term improvisation and informal planning with limited resources. Municipal and other government sponsors are generally deeply committed to community-driven development strategies, but all parties face complicated, fraught processes in building consensus and maintaining legitimacy within their own spheres. The WPI presence for just two short months can offer a sense of urgency that partners can exploit to drive planning and implementation processes forward, but when they invite students in, they also take on significant risk–reputationally, politically, programmatically, and with people’s sometimes fragile sense of hope about making things happen. WPI students and faculty of course also have much at stake in achieving results that they and others see as meaningful. Fortunately, students have indicated in reflection exercises and post-project evaluations nearly universal high levels of satisfaction with their projects as learning experiences, especially so perhaps with the projects that change most dramatically and are most challenging. In the Sustainable University course at Clark, project redefinition usually arises at the juncture between engaging campus partners and starting to develop actionable plans. Student teams often envision outcomes that are grander in scale than is realistically achievable within the semester timeframe or the institutional constraints of the university. In one project, a team was tasked with advancing an edible landscape on campus to promote wildlife habitat and raise awareness about permaculture, and food sourcing. Upon receiving general support from campus facilities staff, the team designed a comprehensive landscape design for a newly landscaped central campus location. Embarking on the design, they discovered the layers of university planning involved in the campus Master Landscape Plan, and the initial goal of installing a large, multi-faceted landscape installation was scaled back to several beds of low-grow edible blueberry bushes along with a plan to further research segments of the master plan in the future. A common tension lies in the goal of accomplishing tangible progress during the semester, while also ensuring that efforts build on the legacy of other campus projects and ongoing efforts; sometimes well-done research and planning is the most valuable deliverable a team can make. All projects involve striking a balance between the pace and sequencing of successful projects in an institutional setting and the students’ desire to be part of an immediate difference. The prospect of “Action” is what animates SAL projects. Students often see action-oriented projects as exciting opportunities to do meaningful work and as a welcome complement (or alternative) to their usual academic studies. Many enter into these programs with relatively little project experience, and thus learning about what it takes to plan and execute change is an important goal. Faculty, even though possessing more experience, also find student projects an opportunity to learn about change possibilities and processes in particular settings. Action can mean many things, however, and whatever its nature, much of it is likely to occur after the students’ involvement ends. How then, can the promise of action be embraced and managed for successful outcomes for all? A starting point is in setting expectations at the outset – what are the ultimate outcomes sponsors and communities seek, and how far along the path can they and students reasonably expect to get in a semester or less? At one extreme, when projects entail very tangible and immediate outcomes such as building something or implementing a program, it is easy for students and others to conceptualize and rally around relevant action. Often, however, what sponsors most want are analyses and recommendations that can form the basis for future action. Even when pursuing “tangible” outcomes, it is important to help students understand that activities such as interviewing and meeting with stakeholders to elicit input and potential support for a project are critical activities to be pursued with care, and reflected upon for maximum project and personal benefit. One of the most valuable aspects of SAL projects is the experience students acquire building networks with professional and other interested partners. In Cape Town, one of the core activities is to help community members make connections and solicit support for community projects from governmental agencies and NGOs. Students’ outsider status, and a certain cultural confidence that most unconsciously carry that leads them to expect that their concerns will be heard, ironically often makes opening doors easier for them than for community members. Once in the door, however, community members usually take the lead. This is a case of students and community members strategizing and learning together, as they do also when preparing written proposals or presentations, something many will not have experienced before. A key to community involvement and shared learning is the regular involvement of two or three local community members as “co-researchers” to work alongside the students through all phases of project development, including continuing with project related activities following the student engagement. At Clark, students are likewise uniquely valued campus constituents whose engagement on particular issues can often stimulate key decision-makers’ interest and support for action in ways that staff or faculty alone might have trouble motivating, or even recognizing. One project team in 2007 developed a proposal for an Eco-Rep program that identifies students in each dorm to promote sustainable lifestyles and practices within dorms and participation in campus sustainability events. The program has grown into a key node among the sustainability networks on campus, facilitating other projects from the Sustainable University course and other initiatives. Just as common, however, are examples where projects do not lead to a successful implementation, or do so only after later teams carry the projects forward, often because the depth of institutional networking and coordination is under-appreciated. Sometimes students are disappointed in the level of influence or scale of the ultimate “action.” Faculty and more importantly sponsors play a critical role in helping students understand the long, difficult process that is usually the prerequisite for social change and sustainability progress. The most tangible dimensions of “change” – putting up a greenhouse, starting a recycling program, building an improved water and sanitation facility, enacting a new policy – are usually the tip of the iceberg that has required lots of preparatory action. Both of the programs described here are designed to achieve cumulative impacts over time, first by working with sponsors and others who are best positioned to carry through on recommendations and networks established through student initiative, and also by having student teams work each year on at least some projects that build from past ones. In this sense, for example, students who worked on water and sanitation issues in Cape Town between 2007-2011 share at a distance in the construction of a facility in 2012. At Clark, the increased involvement of the sustainability coordinator as a key project sponsor also helps ensure a legacy of projects over time. These considerations of timing, process, networking, and project re-design provide students with challenges that are generally not encountered in their other college-level course work. Both the Clark and WPI programs have formal and informal learning objectives for students that emphasize growth and development in areas that are often deeply personal and harder to measure than content acquisition or skill development in traditional courses (Jiusto & DiBiasio, 2006). The expectation is that students will learn not just about the complex and emergent process of sustainability, but that they will develop self-awareness about how to work with others in teams, develop capacities for self-directed learning (Jiusto & DiBiasio, 2006), and learn how to identify and appreciate diverse perspectives. As with experiential education programs of all sorts, the route by which many of these learning objectives may be realized is only partially knowable and controllable, and students will have very different starting spots, needs and opportunities for growth. Just as students are required to shoulder the main responsibility for “making their project go,” they are also responsible for making sense of their experiences and distilling from them value for themselves and others. Communication is central to this process. Within the Sustainable University course, each team presents a mid-semester presentation to the rest of the class, which is an opportunity for reflection and peer feedback. There is also an emphasis throughout the semester on teamwork and group dynamics, and students reflect on their learning in these areas through reflection integrated into weekly reading response papers as well as other short, targeted team project reflection assignments. At the end of the semester, instead of a final exam, the students design, coordinate and implement a final public presentation and a final report that communicates the details of all that the teams have accomplished throughout the semester. Distilling the work into final presentations provides an important opportunity for the groups to synthesis their learning, and the public presentation has developed into a well-attended campus event that brings sponsors, students, faculty and other members of the community together. Faculty members have also made it a regular practice to debrief the projects with the campus sustainability coordinator and other campus partners who worked closely with the projects. At the Cape Town Project Centre, various methods for individual and collective reporting have been explored to encourage reflection and help students make sense of their experience. Students routinely prepare project proposals, presentations, meeting agendas and minutes, posters, brochures and planning documents, individual reflective essays, formal reports, and project websites. Students also often create with community co-researchers publications, presentations and media to distill into accessible language and images the significance of what they have done together and what they are proposing for the future. Students and their community colleagues often find the experience of presenting exhilarating, and their audiences often include local politicians, business leaders, academics and development professionals, community members, and others. Recently, a more novel reporting technique has been utilized. Students are asked to prepare written “scenes” through which they, as individuals or teams, use metaphors of theatre to describe important events and what people were saying or doing about important matters. One scene all students prepare is their first impression upon arriving in their project community – the look, feel, smells, sounds, etc. Another was their first meeting on-site with project sponsors and other stakeholders. Other scenes might be short vignettes about encounters with individuals that led students to understand that not everyone agrees with their ideas – always a formative and potentially deflating experience, especially if not thought about carefully. Scenes are presented on the project website for public access, though may be password protected if particularly sensitive issues are discussed. Scenes are grouped and summarized into weekly Acts, providing a narrative of project development. Each scene begins with a brief “backstory” and cast of characters, setting the stage for the main scene, which explores the tensions, motivations and evolution of main characters, including students themselves. The scenes conclude with students reflecting about the significance of the scene for the project and/or themselves. The pursuit of sustainability is an emergent, inventive process. At the local level, sustainability is a process grounded in the often contradictory imaginations and creative impulses of many different people. 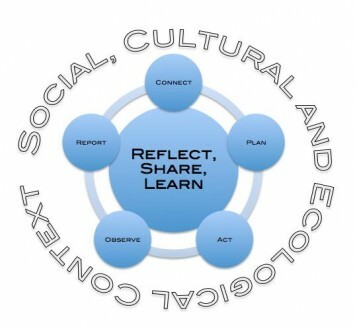 The discourse of “Shared Action Learning” forefronts this emergent reality, providing a language and set of expectations about what may be encountered as diverse stakeholders – students, sponsors, community members, faculty, and others – work toward solutions together. Experiential learning is increasingly valued across academia and in the broad field of sustainability as an effective way to develop capacity for self-directed learning, resourcefulness and collaborative problem-solving skills. New programs that involve faculty and students responding to community needs are emerging all over the world. The University of Minnesota’s Resilient Communities Program embodies aspects of the approach we describe here, as do the solutions-oriented, project-based curricula at innovative schools like Prescott College and Warren Wilson Institute. The Oberlin Project as Oberlin College similarly promotes campus-community partnerships particularly in the pursuit of a post-fossil fuel community. WPI’s Global Perspective Program includes domestic as well as international project centers, including one in our home community of Worcester, Massachusetts. Students in such programs engage directly with challenges associated with promoting sustainability and fostering institutional and social change within a specific community context. Whether in a study-abroad immersion experience like the WPI Cape Town projects or in a campus community experience like the Clark University projects, the opportunities for shared action learning are robust. An important lesson is the deeply human nature of sustainability transitions, whether addressing issues of politics and power, institutional bureaucracy and change, or knowledge and positionality. SAL programs help move the sustainability discourse, particularly in higher education, toward this more inclusive and integrative understanding. The lessons emerging from these SAL programs for sustainability can provide justification for additional curriculum reform. David Orr recently pointed out the irony of “green operations and brown curricula” that characterize more narrow approaches to sustainability in higher education (Orr, 2012). Incorporating the notions of sharing and learning, along with appreciation of the emergent properties of sustainability, provides impetus to significantly re-think how the university engages with sustainability across its mandates. As universities continue to innovate in exciting new ways, the SAL approach may provide a helpful way to frame endeavors that link students and faculty with community partners. The case studies presented in the paper help elucidate the roles and relationships of different stakeholders as projects evolve. We emphasize that in SAL projects, expectations often shift away from technological solutions as the importance of relationships, networks and communication are realized. All actors involved confront challenges to their expectations and norms. Students are asked to shift from their long-held view of learning through acquisition to learning through practice. Perhaps the most difficult challenge for them is to be held accountable not only to an instructor, but to community members, sponsors, team members, and their own beliefs about what a successful project outcome would be. Faculty are challenged to relinquish the notion that they are knowledge-bearers. In many contexts the faculty may have little knowledge beyond what students know, and so faculty also grow through sharing and learning. Community members and sponsors learn to accommodate student inexperience, schedules and working modalities, on the expectation that broader impacts accrue through the specific project outcomes as well as institutional linkages that build over time. Sponsors and community members also, at times, take on the role of educator and student. As universities increasingly turn outside of the ivory tower and toward engagement with community needs and user-defined problems, new approaches are needed to guide these undertakings. SAL highlights the emergent and co-created nature of knowledge for sustainability. Opportunities exist for such projects through international partnerships as well as in communities in the US, including campus communities. The SAL framework emphasizes the lessons of diversity and difference, and of effective relationship-building and communication, which provide a foundation for sharing and learning. Arum, R. & J. Roksa (2011). Academically Adrift: Limited Learning on College Campuses Chicago, University of Chicago Press. Blackstock, K. L., G. J. Kelly & B. L. Horsey (2007). “Developing and applying a framework to evaluate participatory research for sustainability.” Ecological Economics 60(4): 726-742. Boyle, M.-E., L. Ross & J. C. Stephens (2011). “Who has a stake? How stakeholder processes influence partnership sustainability.” Gateways: International Journal of Community Research and Engagement 4: 100-118. Breen, S. D. (2010). “The mixed political blessing of campus sustainability.” PS: Political Science and Politics 43(4): 685-690. Budwig, N., D. Baird, W. Wright, P. David & K. Carville (2011). Liberal Education and Effective Practice: Clark LEEP Working Document #1. http://www.clarku.edu/aboutclark/leep/pdfs/Framework_Feb23.pdf. Worcester Massachusetts, Clark University. http://www.clarku.edu/aboutclark/leep/pdfs/Framework_Feb23.pdf. Butin, D. W. (2006). “The limits of service-learning in higher education.” The Review of Higher Education 29(4): 473-298. Campbell, S. (1996). “Green cities, growing cities, just cities? Urban planning and the contradictions of sustainable development.” Journal of the American Planning Association v62(n3): p296(217). Cash, D. W., W. C. Clark, F. Alcock, N. M. Dickson, N. Eckley, D. H. Guston, J. Jager & R. B. Mitchell (2003). “Knowledge systems for sustainable development.” Proceedings of the National Academy of Sciences of the United States of America 100(14): 8086-8091. Clark, W. C. (2007). “Sustainability science: A room of its own.” Proceedings of the National Academy of Sciences of the United States of America 104(6): 1737-1738. Crow, M. M. (2008). Hope, change, and affirmation: New values to guide institutional innovation in american higher education, Speech, College Board Forum, Houston, Texas, November 6, 2008. Elmes, M. B., S. Jiusto, G. Whiteman, R. Hersh & G. T. Guthey (2012). “Teaching social entrepreneurship and innovation from the perspective of place and place-making.” Academy of Management Learning & Education 11(4): 533–554. Eyler, J. S., D. E. Giles, C. M. Stenson & C. J. Gray (2001). What we know about the effects of service-learning on college students, faculty, institutions, and communities, 1993-2000. Introduction to Service Learning Toolkit. C. Compact. Providence, Campus Compact. Greenwood, D. J., W. F. Whyte & I. Harkavy (1993). “Participatory action research as a process and as a goal.” Human Relations 46(2): 175-191. Jiusto, S. & D. DiBiasio (2006). “Experiential learning environments: Do they prepare our students to be self-directed, life-long learners?” Journal of Engineering Education 95(3): 195-204. Jiusto, S. & R. Hersh (2009). Proper homes, toilets, water and jobs – a new approach to meeting the modest hopes of shackdwellers in Cape Town, South Africa. Proceedings of the 4th International Conference on Sustainable Planning and Development. C. A. Brebbia, M. Neophytou, E. Beriatos, I. Ioannou and G. Kungolos. Southampton, UK, WIT Press. Kajikawa, Y. (2008). “Research core and framework of sustainability science.” Sustainability Science. Kates, R. W. (2002). “Humboldt’s dream, beyond disciplines, and sustainability science: Contested identities in a restructuring academy.” Annals of the Association of American Geographers 92(1): 79-81. Kates, R. W., W. C. Clark, R. Corell, J. M. Hall, C. C. Jaeger, I. Lowe, J. J. McCarthy, H. J. Schellnhuber, B. Bolin, N. M. Dickson, S. Faucheux, G. C. Gallopin, A. Grubler, B. Huntley, J. Jager, N. S. Jodha, R. E. Kasperson, A. Mabogunje, P. Matson, H. Mooney, B. Moore, T. O’Riordan & U. Svedin (2001). “Sustainability science.” Science 292(5517): 641-642. Kindon, S., R. Pain & M. Kesby (2008). Participatory action research. International Encyclopedia of Human Geography. Amsterdam, London, Elsevier: 90-95. Labaree, D. F. (2006). “Mutual subversion: A short history of the liberal and the professional in American higher education.” History of Education Quarterly 46(1): 1-15. Lang, J. M. (2012). “The grounded curriculum: How can our courses and teaching capitalize on the benefits of a physical campus?” The Chronicle of Higher Education July 3 2012. Levin, M. & D. J. Greenwood (2008). “The future of universities: Action research and the transformation of higher education.” The SAGE handbook of action research: Participative inquiry and practice: 211-226. Martin, R. E. (2011). The College Cost Disease: Higher Cost and Lower Quality. Northampton, MA USA & Cheltenham, UK, Edward Elgar Publishing Limited. Mathie, A. & G. Cunningham (2003). “From clients to citizens: Asset-based community development as a strategy for community-driven development.” Development in Practice 13(5): 474-486. Maurasse, D. (2001). Beyond the Campus: How Colleges and Universities Form Partnerships with Their Communities. New York, Routledge. McIlrath, L. & I. Mac Labhrainn, Eds. (2007). Higher Education and Civic Engagement: International Perspectives. Perspectives: Policy and Practice in Higher Education. Burlington, VT, Ashgate. Mohan, J. (1995). “Thinking local: Service-learning, education for citizenship and geography.” Journal of Geography in Higher Education 19(2): 129. Molnar, C., T. Ritz, B. Heller & W. Solecki (2011). “Using higher education-community partnerships to promote urban sustainability.” Environment: Science and Policy for Sustainable Development 53(1): 18-28. Nevens, F., N. Frantzeskaki, L. Gorissen & D. Loorbach (2013). “Urban transition labs: Co-creating transformative action for sustainable cities.” Journal of Cleaner Production. O’Brien, W. & J. Sarkis (2012). Sustainability consulting projects and high impact educational learning. Marsh Institute Working Paper 2012-23, Clark University, Worcester, MA. http://www.clarku.edu/departments/marsh/news/WP2012-23.pdf (Last Accessed August, 2012). Orr, D. (1994). Earth in Mind, On Education, Environment, and the Human Prospect. Washington DC, Island Press. Orr, D. (2012). Leadership Award Address. ACUPCC Annual Summit, Washington, DC, June 22. Palmer, M. A., E. S. Bernhardt, E. A. Chornesky, S. L. Collins, A. P. Dobson, C. S. Duke, B. D. Gold, R. B. Jacobson, S. E. Kingsland, R. H. Kranz, M. J. Mappin, M. L. Martinez, F. Micheli, J. L. Morse, M. L. Pace, M. Pascual, S. S. Palumbi, O. Reichman, A. R. Townsend & M. G. Turner (2005). “Ecological science and sustainability for the 21st century.” Frontiers in Ecology and the Environment 3(1): 4-11. Rappaport, A. (2008). “Campus greening, behind the headlines.” Environment, Science and Policy for Sustainable Development 50(1): 6-16. Rappaport, A. & S. H. Creighton (2007). Degress that Matter. Cambridge, MA, MIT Press. Rowe, D. (2007). “Sustainability: Education for a sustainable future.” Science 317: 323-324. Sadler, T. D., S. Burgin, L. McKinney & L. Ponjuan (2010). “Learning science through research apprenticeships: A critical review of the literature.” Journal of Research in Science Teaching 47(3): 235-256. Selby, D. (2007). “As the heating happens: Education for sustainable development or education for sustainable contraction?” International Journal of Innovation and Sustainable Development 2(3/4): 249-267. Sharp, L. (2009). “Higher education: The quest for the sustainbility campus.” Sustainability: Science, Practice, and Policy 5(1): 1-8. Smith, L., L. Bratini, D.-A. Chambers, R. V. Jensen & L. Romero (2010). “Between idealism and reality: Meeting the challenges of participatory action research.” Action Research 8(4): 407-425. Smith, L., L. Bratini, D. A. Chambers, R. V. Jensen & L. Romero (2010). “Between idealism and reality: Meeting the challenges of participatory action research.” Action Research 8(4): 407-425. Stauffacher, M., A. I. Walter, D. J. Lang, A. Wiek & R. W. Scholz (2006). “Learning to research environmental problems from a functional socio-cultural constructivism perspective: The transdisciplinary case study approach.” International Journal of Sustainability in Higher Education 7(3): 252-275. Stephens, J. C. & A. C. Graham (2008). “Climate science to citizen action: Energizing nonformal climate science education.” EOS 89(22): 204-205. Stoecker, R. & E. Tryon (2009). The Unheard Voices: Community Organizations and Service Learning. Philadelphia, Temple University Press. Tamura, M. & T. Uegaki (2012). “Development of an educational model for sustainability science: Challenges in the Mind-Skills-Knowledge education at Ibaraki University.” Sustainability Science 7(2): 253-265. Thomas, N. L. (2010). “Why it is imperative to strengthen American democracy through study, dialogue and change in higher education.” Journal of Public Deliberation 6(1). Vercoe, R. & R. Brinkmann (2012). “A tale of two sustainabilities: Comparing sustainability in the Global North and South to uncover meaning for educators.” Journal of Sustainability Education. Wainwright, J. (2010). “Climate change, capitalism, and the challenge of transdisciplinarity.” Annals of the Association of American Geographers 100(4): 983-991. Weissman, N. B. (2012). “Sustainability and liberal education: Partners by nature.” Liberal Education 98(4).